Karun Chandhok Chennai-born racing driver is the second racing driver from India after Narain Karthikeyan in formula one racing. Read here about Karun Chandhok Indian Formula One F1 Racer Biography his achievements on Indian Car Racing and Record breaks. Karun Chandhok born on January 19, 1984, is the second racing driver from India to race in Formula 1 after Narain Karthikeyan First Racing Driver in India. Karun Chandhok, Indian Formula One F1 Racing Driver showed a promising profile in F1 and within a few races he achieved and won a number of championship points. Karun Chandhok was born to a Punjabi father and Tamil-Brahmin mother. Karun Chandhok's grandfather Indu Chandhok founded the Federation of Motor Sports Club in India in the 1950s and Karun's father Vicky Chandhok was the former president of the Federation of Motor Sports Club in India(FMSCI) raced in the 1970s. As Karun Chandhok grew up in a motor sport environment, there is no doubt that Karun Chandhok had a strong influential figure in F1 circles. In 2000, upon winning seven out of ten races in the Formula Maruti Series, Karun Chandhok crowned the Indian National Racing Champion where he scored Pole position and fastest lap in all ten races which is still a national record. He then progressed and drived the 'Team India Racing' on Asia-wide Formula 2000 series where he won the title Formula 2000 Asian Champion, making the history as the youngest ever Asian Formula Champion and also he is the first Asian to win the opening five races of the season where he made a record by winning eight races in a year. His next step was that he was tested with British Formula 3 Champion Team Carlin Motorsport in 2001. Karun becomes a regular front runner in most of the series and he raced in motorsport, the British Formula 3 National Class in 2002 driving for T-Sport with six top and finished third in the final class standings. He finished 14th in the standings in 2004 by stepping up in British Formula 3 Class with T-Sport. Chandhok was the first driver who represented A1 Team India in A1 Grand Pix in 2005-06 season in the World Series - Formula Renault 3.5 Series with RC Motorsport. The historic champion Karun Chandhok is the recipient of the firt ever Formula Asia V6 Renault Championship in 2006 with seven race wins and nine pole positions from 12 races. The Formula V6 Championship of Karun Chandhok's opened up the door for GP2 series, the official support series for Formula One Championship with Durango Racing in the year 2007, where he took his first victory at Spa- Francorchamps at Spa-Fracorchamps Circuit in Belgium and as a result and in a way to honour, the Indian National Anthem was played for the very first time at the Formula One Grand Pix event. Karun Chandhok's biggest career break was in the late years of 2007, for he was invited by the Red Bull Racing team to test their Formula One Car and driving a Formula One Car will be the ultimate goal of any racer and Karun Chandhok was fortunate enough to achieve this at the age of just 24. He continued in GP2 for 2008 with iSport International team where he was partnered by his future F1 team mate Bruno Senna. In 2008-09 GP2 Asia Series season Chandhok drove for the team and after winning a race and finishing tenth in the championship, he was awarded for 'Best Driving Style' at the end of the season. In the 2009 GP2 series, Karun Chandhok signed to drive for the Ocean Racing Technology. Force India is an registered team formed in the year 2008 by Vijay Mallya, where Karin was constantly linked. In 2009 season, after Giancarlo Fisichella moved from Force India to Ferrari, Karun was linked with the seat with long time supporter Bernie Ecclestone wanting him in the seat. But instead, Vitantonio Liuzzi was promoted to the race seat and after he was confirmed as a race driver, Vijay Mallya stated that he would offer an opportunity to prove themselves in the McLaren F1 simulator, the test that could lead to future race drive with Force India. The Indian ace Karun Chandhok joined former GP2 team-mate Bruno Senna in the team on 2010 season driving for Hispania Racing. In 2010 Bahrain Grand Prix which was Karun Chandhok's first race which was not easier for Chandhok as the car developed a serious hydraulic problem and there by he was not in a position to complete a lap in any of the free practice session. But however he managed to qualify for a session to run his F110 for the first time. He took up the final spot on the grid and set 1.7 seconds slower than his team-mate and Chandhok crashed out of the race after just one lap due to a large bump in the tarmac which sent him crashing into the wall. He finished his 15th and 17th standings in Malaysia and China respectively. 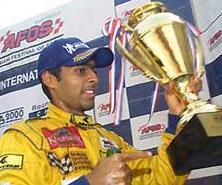 Throughout Karun Chandhok proved himself to be the most consistent and successful Indian Motorsport Driver. Karun Chandhok Place of Birth: Chennai, India. 2000 - Indian National Racing Champion with a record breaking 7 race victories. 2001 - Youngest ever Asian Formula Champion. Awarded as "Most Promising Asian Driver of the Year". 2002 - Stood 6th in the British Formula 3 National Class with 6 top 3 finishes. Awarded overdrive Magazine's "Motorsport man of the year". 2003 - Stood 3rd in the British Formula 3 National Class winning score 19 podium finishes in 24races with T-Sport. He becomes India's first certified instructor at Silverstone Race School. 2004 - Front Runner in British Formula Three with T-Sport. Won 'Motorsport man of the year' for the second time. 2005 - Raced World Series by Renault with RC Motorsport. Represented India in A1 Grand Prix. 2006 - Awarded with first ever Formula Asia V6 by Renault Championship. Karun Chandhok to test with Team Lotus in Spain.... ! Where will Karun Chandhok be in Formula One( F1) in 2011? Are you keen to know more about this? Stay connected with SportVale where you can follow Karun Chandhok's upcoming career news....!